The Skies Collection presents interpretations of Nature's art... transitory illusions illustrated to provoke imagination. Although part of Skies, Accumulating Cumulus is a separate collection because these pictures are unlike the others in the Skies group. The illustrations in the Accumulating Cumulus Collection started in Sweden, where these formations of cumulus clouds evolved during the afternoon of the summer solstice. The Swedes call that day Midsommer (mid-summer). Midsommer is Scandinavia's highest holiday; but it is an enigmatic one as everyone celebrating the logest day knows that the shortest is now approaching. 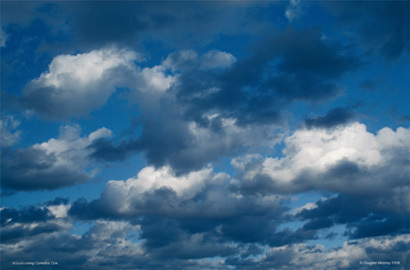 When you live in darkness and cold half the year, summer cumulus bring special lightness to the heart. Little did these clouds know that one day they would float before my eyes again, to be reincarnated and live on in my mind, and now in yours. Little has been done to enhance or otherwise interpret these collossal cumulus clouds. Every change felt like "guilding the lilly," an old but apt expression. Let them drift across your thoughts as they once floated across the skies of southern Sweden on a Midsommer afton, so long ago. Click here to view the full Accumulating Cumulus Collection catalog. 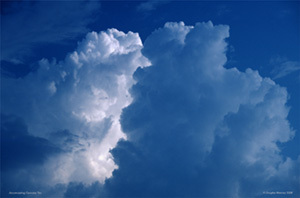 Click here for a trifold brochure of a partial Accumulating Cumulus Collection.